Sandwich cookies are a way to eat two cookies when you’d normally only allow yourself one. So there’s that. 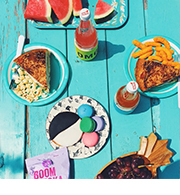 These cookies are so good you might want to just eat them as you sandwich them. I won’t judge you for that. I made half of the recipe below, so I ended up with about 15 duos. Did you know that half of 3/4 a cup is 6 tablespoons or a heaping 1/3 of a cup? I bet you knew. 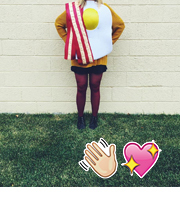 You’re one smart sandwich cookie. Preheat the oven to 350 degrees F. Postion the rack in the center of the oven. Line a baking sheet or two with parchment paper. In a medium bowl using an electric hand mixer or using a stand mixer beat the butter at a medium speed until soft and fluffy. 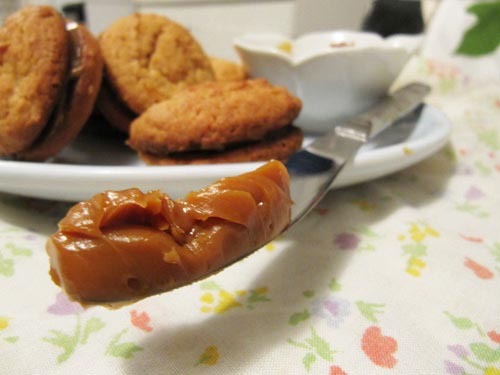 Add the 3/4 cup dulce de leche and both sugars and continue to beat until light and fluffy, about 3 minutes. Add the eggs one at a time, beating for 1 minute after each addition. Reduce the mixer to low and add the dry ingredients, mixing only until they disappear into the batter. Spoon the dough onto the baking sheets, using a heaping teaspoon or cookie scoop leaving 2 inches in between. Bake the cookies for 10 minutes, rotating the pans halfway through bake time. The cookies will be honey brown and super soft. Allow to cool on the cookie sheet for a minute or two before transferring to a wire rack to cool completely. Continue with the rest of the dough until all the cookies are baked. 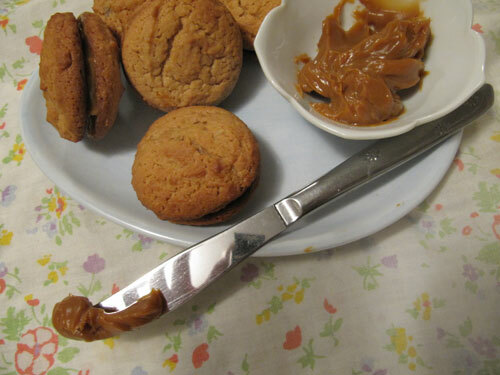 When the cookies are completely cool, spread the flat bottoms of half the cookies with a small amount of dulce de leche and sandwich with the flat sides of the remaining cookies. Just ignore my wrinkly shirt and look for this can of hopes and dreams at the store. Oh, boy. These look divinely scrumptious. I think I may have to give these a test run between my chompers real soon. And your cake tattoo is just perfect. Hooray! I bet you’d love these little carmel-y sandwiches. They’re dreamy like that brown sugar cake! They look great, am not sure I have ever seen this stuff in the store, where might I find it, by the frosting? Sounds like a perfect week-end project. Your Mom is not going to like the wrinkled shirt!! How can you cook to early in the morning, all I want then is my COFFEE!! Thanks Judy! I found it in the baking aisle, near the chocolate chips and other miscellaneous baking items. It’s tasty! I hope you can find it! I made these last night. I’m with you about the coffee in the morning. it’s a necessity! … but these cookies do match super well with coffee. 🙂 If you felt like making them bright and early. These look fantastic! I need to broaden my cookie horizons and this looks like a great way to do so. i made these cookies and finished them the same day. deeelish! anyhoo i really wanted to let you know how awesome your tat is. Well thanks Flash! I’m glad you liked the cookies and the tattoo, even! It’s brand new. I have these bookmarked to make! They’ll be my first recipe using delche de leche I think 😀 They look yummmyyyyyyyy ! Holly and I just made your German Pancakes and they turned out amazing! Nice Louise! I bet you’ll love them! 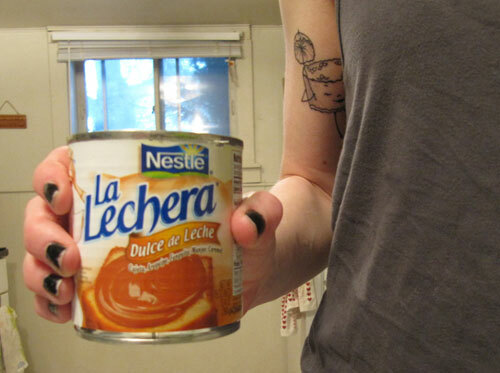 Dulce De Leche is such a cool flavor! So tasty. Austin! I’m so excited you made the German Pancakes! I love those guys. It’s magic how the sides get puffy and tall.